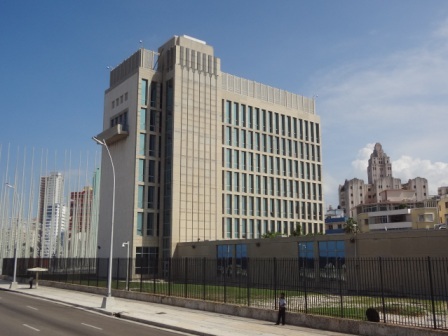 There is a building along the Malecon, in Vedado, that was known as the US Interests Section. The former United States Interests Section is now renamed The Embassy of the United States of America. 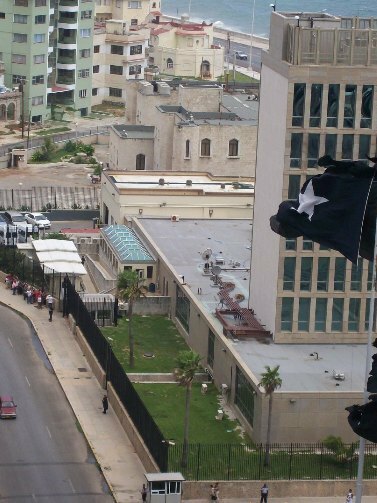 The US has reopened its embassy in Cuba more than 54 years after it was closed, in a symbolic step between both countries. It is staffed by American foreign service people and local Cubans who are also employed by Uncle Sam. They process Cubans wanting to emigrate. They take a constant flow of Cuban applications for migration to America. It was designed by Harrison Abramovitz architects and was built on Havana's Malecon in 1953. Though diplomatic relations with Cuba were broken in 1961 by President Eisenhower, they were normalized under the Carter administration in 1977.
the notorious Mariel boatlift in April 1980. Eventually 125,000 Cubans left the island in the ensuing months, mostly for the United States. When the young Cuban boy, Elian Gonzalez, was still in Florida in 2000, an empty field near the American Interests Section was paved over. 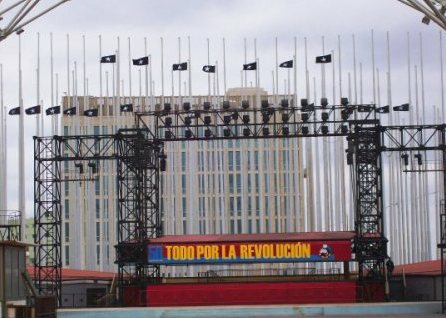 With the help of Cuban students, a stage was built. It is called the Jose Marti Anti-Imperialist Plaza and is largely used for outdoor meetings.